Suffering follows man like a shadow. Man faces distress, whether in the form of illness, financial crisis, loss of loved ones, attacks of enemies or severe emotional breakdowns. He encounters these in some way or the other throughout his life and they mar the little happiness that he may enjoy from time to time. Whether the distress is real or imaginary, he needs a solution to counteract it. Adi Sankara must have experienced this more than anyone else. Thus, out of his immense compassion, he has left behind a mantra shastra in which a remedy can be found for each and every affliction. Each sloka is a mantra which can bring a specific benefit through the blessing of Devi. 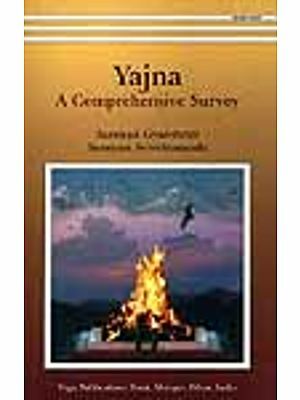 Feeling the need to present this shastra for the benefit of humanity, I inspired Swami Satyasangananda to take up the task of this monumental work after she completed her commentary on Vijnana Bhairava Tantra, which figured in a recent survey as an outstanding book on tantra and yoga, in terms of authenticity and popularity. I asked her to present this classical subject from the point of view of a non-classical person, so that the layman can grasp the relevance of this text in his day to day life. In actual fact there was no need for another commentary as this sacred composition, Saundarya Lahari, has many commendable commentaries to its credit for scholars, which are academic, intellectual and most classical. 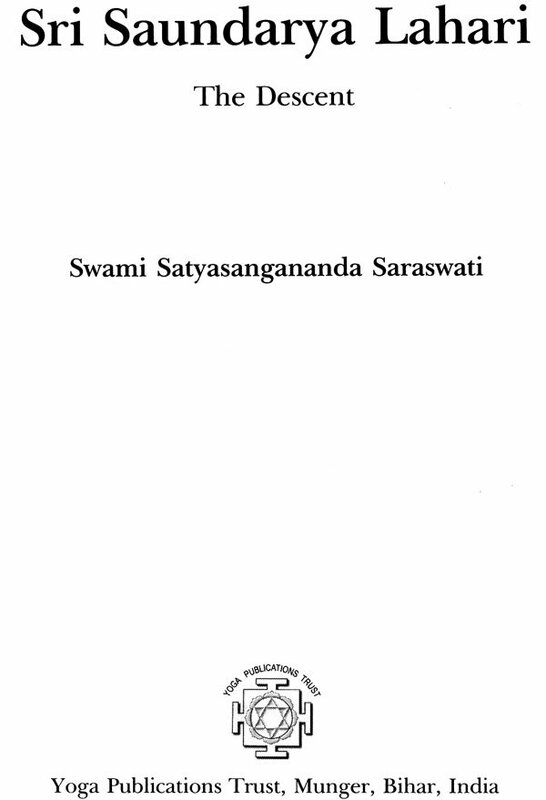 Swami Satyasangananda, however has aimed her commentary towards the ordinary reader, a category which the majority falls under. Her sound analysis of tantric upasana, its immense benefits and efficacy in averting difficulties through anusthana of mantra, yantra and mandala caters to the layman, who is in dire need. Side by side it will also be of immense use to a sadhaka who wishes to expand the frontiers of his mind and discover that he is essentially Divine. May the Goddess Tripura Sundari shower her blessings in abundance on the upasaka of Saundarya Lahari. Early one morning in 1986, two years before his departure from Bihar School of Yoga, Munger, Swami Satyananda called all the sannyasins to his kutir. Naturally, we were eager and excited, as we sat down before him. The room was full of sannyasins and he said, “From today, we will begin the chanting of Saundarya Lahari every morning at four am. Please be here on time each day.” After that, each morning we all poured in and chanted the sacred mantras, many of us not familiar with the Sanskrit letters, and most of us unable to understand what we were reading. But that did not matter in the least, for the chanting of these mantras with Gurudev gave us so much anandam, bliss. When we became proficient in chanting. Sri Swamiji asked us to do likhit japa, writing of the sacred hymns, as well as to draw the yantras related to each mantra. He pasted the yantras on a board each morning for all of us to see and copy in our drawing books. This was a fantastic experience, which every sannyasin who had the good fortune to be present must still be treasuring in the depth of his heart. It was truly unforgettable. Although we did not know it at that time, Sri Swamiji was giving each of his sannyasins the master key that would help to overcome any difficulties he might face in life, whether material or spiritual. In addition, he was revealing a way to peace, plenty and prosperity through Devi aradhana, worship. Soon after that Sri Swamiji left Munger and all his sannyasin disciples, but not before he had given them an invaluable treasure. During those classes it was my duty to prepare the yantras each day on giant sized sheets of drawing paper for all to copy. I must have drawn all of those yantras at least a dozen times each. I found them truly fascinating and enjoyed every moment of it. Then I began to collect the usage of each mantra and yantra, and to see how it should be made effective. Naturally my interest deepened as I began to understand the immense importance of these hymns for each and every one of us. That is how this book was born. Each time I read the text, or chanted the slokas, or practiced the prayogas, or contemplated on them, the feeling I got was that I was diving into the deep and bottomless ocean. Just as you find new gems, new life, new treasures, every time you go deep sea diving, in the same way, each and every time I discovered something new about this amazing work of Adi Guru Sankaracharya. Just as the depth of the ocean can never be fathomed unless you are a very skilled diver and even then there are portions that you may never discover, in the same way, the depth of this work can only be fathomed by a person, such as Adi Guru Sankaracharya. The countless jewels that the reader can assimilate depend entirely on the grasp of his awareness. For those who are in tune there is no limit to their understanding. Nevertheless, the Devi will guide each one of us to understand it in the way that she knows is best for us. The understanding of this work is an ongoing process which is aided by the sadhana of Shakti worship. Thus, nothing that can be said on this magnificent work is final; there are always new ways of looking at it which the reader will experience the more he plunges into the depths of this sacred hymn, for Saundarya Lahari brings the reader closer to his own Self. 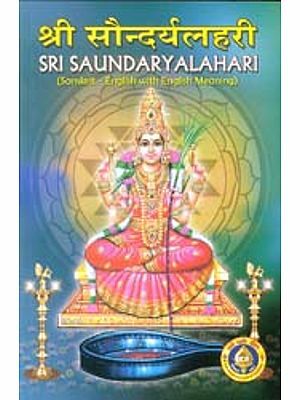 Saundarya Lahari is an eminent text on tantra shastra, which describe the worship of Parabrahman or absolute consciousness in the form of upasana Shakti, or Sri Vidya. 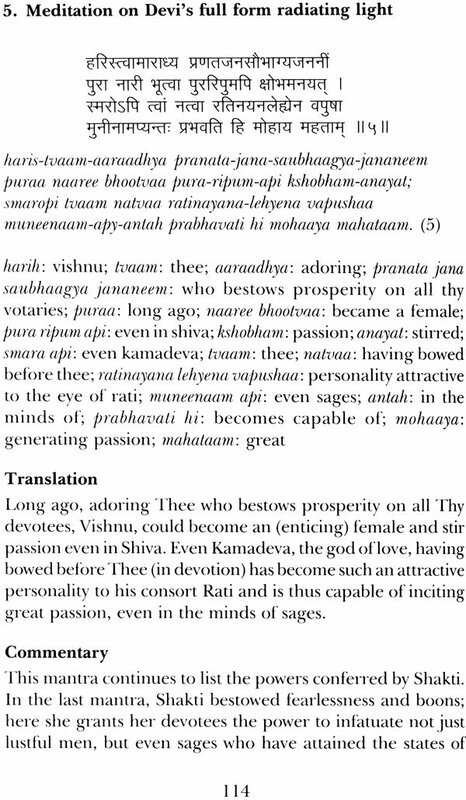 It reveals the essence of Sri Vidya, which is the reason why maximum commentaries have been written on it. 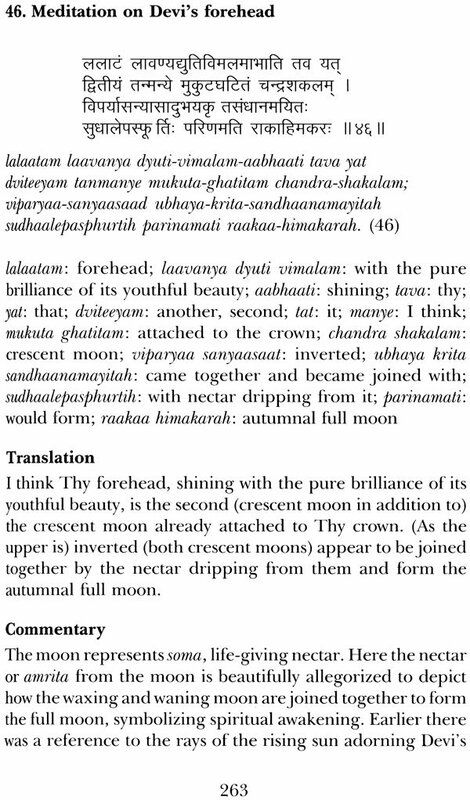 This sacred hymn reflects Adi Guru Sankaracharya’s heightened flight of imagination, the affectionate smooth flow of his devotion, and the unique poetic touch of hiss profound contemplation. It also provides an insight into the secrets of agama and tantra by giving a descriptive account of kundalini yoga, chakras and various topics on tantra. 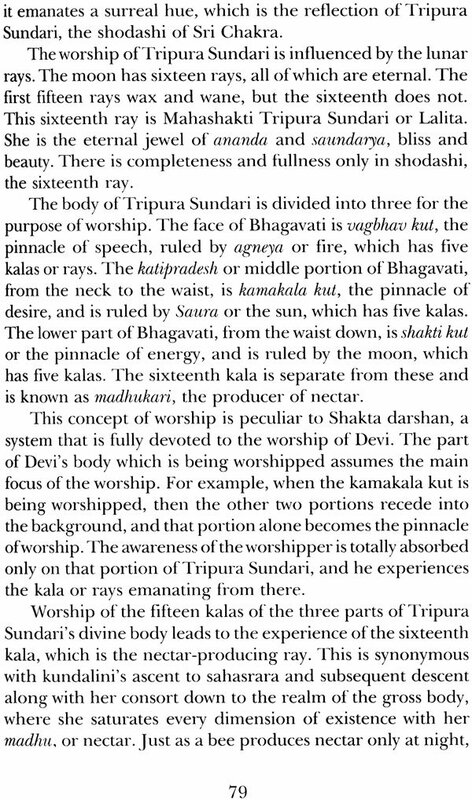 This text is a compilation of beautiful stotras in praise of Devi or Tripura Sundari. 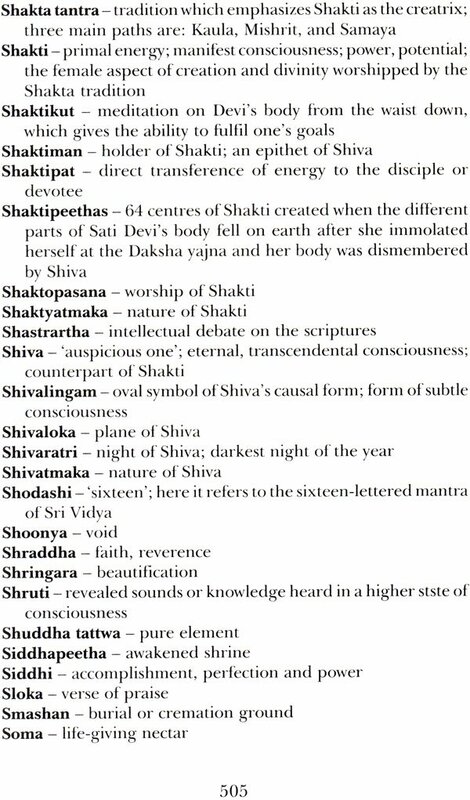 These slokas are associated with many mantras and yantras through which the Devi can be worshipped for the acquisition of various siddhis or supernatural powers. Devi in the form of Sri Vidya is worshipped in two forms: intrinsic, for the highly evolved practitioners, and extrinsic, for the less evolved practitioners. The intrinsic form of worship has neither ritual nor method. The form of Parabrahma Shiva along with Shakti is worshipped in the various energy centres or chakras within the human body. Those internal practitioners who believe in the unity of Shiva and Shakti can awaken their kundalini and raise it through the various chakras to sahasrara by worship and mantra japa. There the individual soul unites with the Supreme soul. In the extrinsic form of worship, Sri Chakra is worshipped. The yantra of Sri Chakra is outlined on gold or any metal sheet. Then the yantra is worshipped by offering mudra, asana arati, incense, light, naivedya and other offerings. Sri Chakra is the culmination of all yoga sadhana. One need not do any yoga practice once perfection is obtained in Sri Chakra. Sri Chakra is made of forty-three triangles and comprises the palatial residence of the Devi. In the Sri Chakra palace, Vishnu resides between the seventeenth and eighteenth walls, Brahma between the sixteenth and eighteenth walls, and Indra and other guarding regents between the fourteenth and fifteenth walls. They all reside in their different places only for the worship of Devi. According to the Devi Bhagavat Purana, all the devas, including: Brahma, Indra, Varuna, Yama, Vayu, Agni, Kubera, Twasta, Poosha, Ashwins, Bhaga, Aditya, Vasu, Rudra, Vishvadeva and Marugan, meditate on the Devi, who is the cause, sustenance and dissolution of the entire creation. By the worship of Devi, one can obtain wealth, learning, riches, success in special work, victory over the enemy, cure of chronic ailments, and so on. 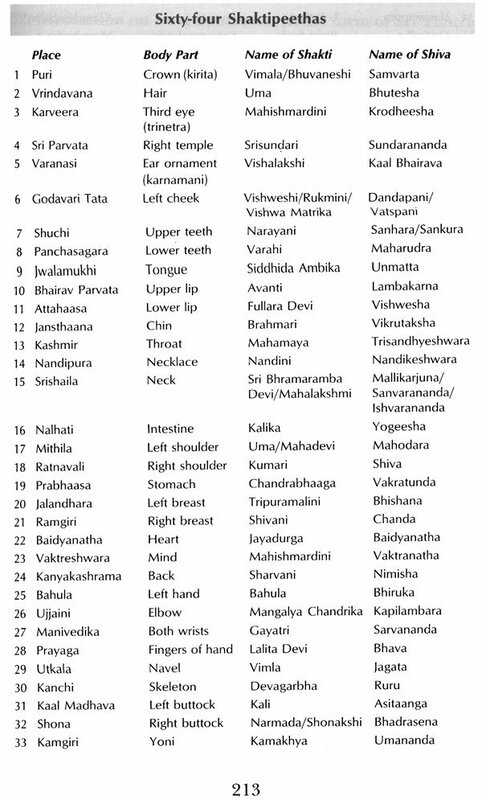 In order to obtain these, various yantras, bija mantras and oblations are utilized. Many people practice these slokas in order to please Devi for the fulfillment of worldly desires. The success depends on the faith and devotion of the sadhaka. If there is some delay in the fulfillment of the desired object, then the practice should be continued with devotion for a few more days. If one prays to the Mother for salvation through these slokas, one can even attain mukti, or liberation, the supreme goal of life. The worship of the Divine as Mother can be traced back to the most ancient times that predate even history. The Gayatri mantra and early vedic hymns in worship of Shakti, personified as Usha, the dawn, indicate the existence of Shakti worship from the earliest times. Of all the images of Shakti, perhaps the dawn, the exact moment when the sun comes up over the horizon, showering the earth with prana, is the most striking. This significant display of Shakti’s splendour and power has been forever enshrined in the Vedas. 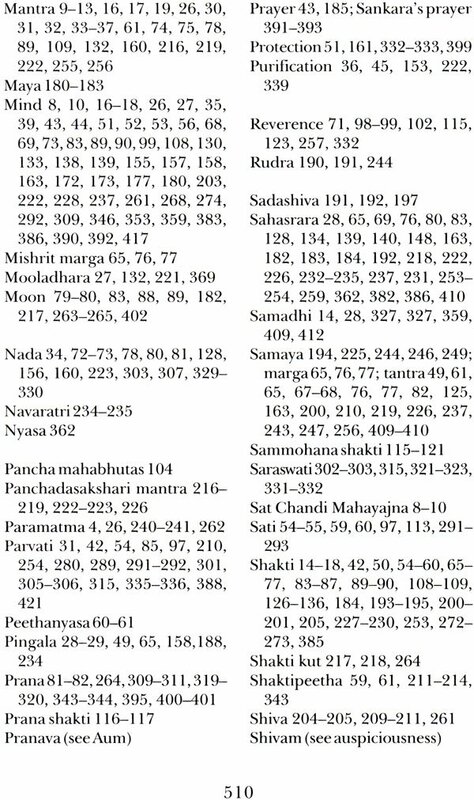 Saraswati, Lakshmi and Durga also finds significant place in the vedic hymns. In early times, the vedic culture was matriarchal, not patriarchal. It spoke of matri bhoomi, the Motherland, and not pitri bhoomi, the Fatherland. People conversed in their matri bhasha, mother language, not pitri bhasha, father language. Sons were addressed by their mother’s name, and belonged to the mother, not the father. Krishna was called Yashodha nandan, son of Yashodha, and Devaki nandan, son of Devaki. Similarly, Arjuna was addressed as Kaunteya, belonging to Kunti. 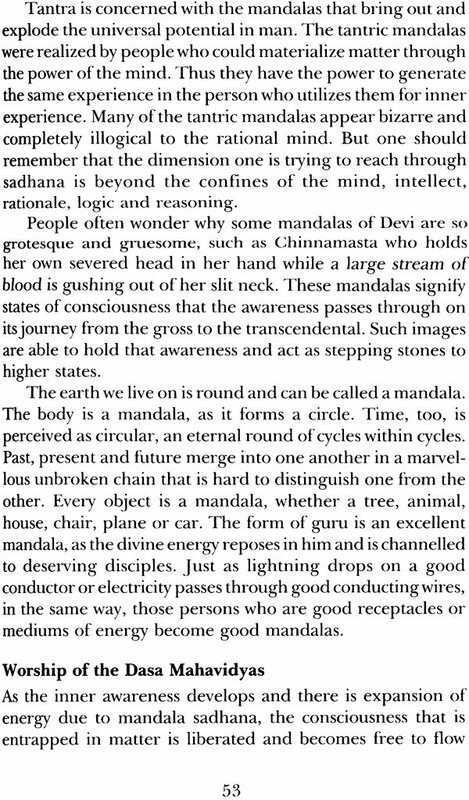 Such examples are found throughout the vedic literature. In the Satya yoga, the devas invoked the power of Devi before they entered into battle with the daityas, or demons. In the Treta yuga, Sri Rama performed the Navaratra, nine days worship of Devi, to invoke the power of Shakti before he set foot on Lanka. Later, in Dwapara yuga, Arjuna invoked Devi before entering the Mahabharata war. In the Kali yuga, Adi Guru Sankaracharya invoked Devi in his time to distress to avert an illness, so that he could accomplish his mission. The deities of the Kali yuga are Devi and Ganesha. They are manifesting everywhere and have infiltrated our very lives. Ganesha represents good living, comfort, luxury, god food, good clothes, art, literature and music. Devi symbolizes immense wealth and unlimited power, coupled with beauty and glamour. In that not what the whole world is mad about today? So this attraction for Shakti has filtered down through the ages to the present day, in spite of the overshadowing influence of other religions and cultures. India is the only land that addresses women as Devi. Whether mother, sister, daughter or wife, she is regarded as Devi. Devi is a combination of Lakshmi, Parvati, Durga and Saraswati. All of her roles are sacred and enacted in every home, such is her immense influence on this land. Twice a year Devi is worshipped throughout India for nine days during Navaratri. This worship is conducted in Christianity also and is known as the Novena, nine days worship of Mary. Navaratri means the nine nights when the soul has to journey through immense darkness to experience the light. The nine nights represent the eight apara prakriti, which are the five tattwas, mind, buddhi and ahamkara, the symbols of darkness, and the one para prakriti, the symbol of illumination. Significantly, both periods of Navaratri occur at specific times of the year when nature is in transition. The first occurs in March, when nature transits from winter to spring, and the second in October, when it transits from autumn to winter. At these times nature is in motion and vibrant with prana to facilitate this transition. The Navaratra worship is very special, because at these times Shakti comes alive. This gives immediate and immense benefits to the worshipper, which can range from the mundane to the sublime. Like Rama, Arjuna, and much later Sankara, we too are in dire need of help during times of distress. There are moments of crisis in our lives when we do need divine intervention, and in this lies the importance of Saundarya Lahari. 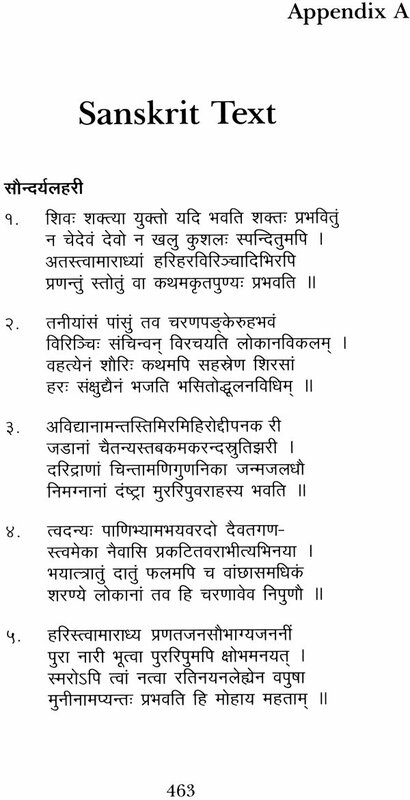 This invocation of the supreme Shakti by Sankara has been recorded by the tradition. Had the stutis, or songs of Rama and Arjuna praising God as Devi, been recorded, perhaps we could have utilized them as well, but unfortunately that is not the case. Sankara’s stuti is most relevant to us today, because it can help to alleviate the crises we face in our daily lives when we are poor, destitute and hungry, when we are struck with disease, grief and loss, or when we want to acquire name, fame and good fortune. Saundarya Lahari can also alleviate mental conflicts such as fear, turmoil, insecurity, depression, disappointment, lack of self-confidence despair, worry and anxiety. It can be utilized for the cure of diseases that are adhidaivika in nature, due to some unknown, mysterious causes that no medicines can heal. Most modern day ailments, which are not of an infectious nature, come under this category. The tradition has given a detailed description of how to utilize these sacred mantras and the benefits that can be derived by the chanting of every sloka, or verse. 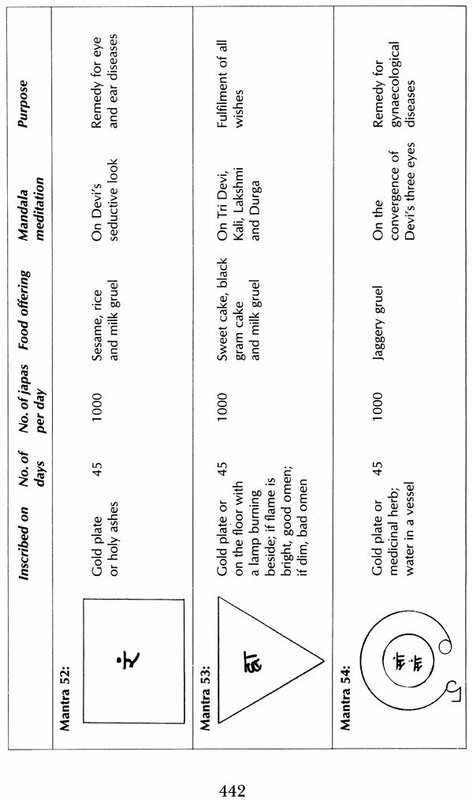 This list is appended at the end of the book for the knowledge and use of the reader. However, to obtain their full efficacy, these mantras and yantras should be known through an adept or proficient guru. These sacred mantras can also be recited daily as a form of worship. It is not necessary to chant the entire Saundarya Lahari every day. Daily chanting can even be done of three, six, nine, twelve (multiples of three) slokas, setting aside ashtami, or the eighth day of the moon, which is specific for Devi worship. On this day the entire Saundarya Lahari can be chanted. Gradually, as you become proficient in chanting the mantras, you can start the practice of likhit japa, or writing the mantras, as well as drawing the yantras in your Saundarya Lahari notebook, which you should keep nicely at you place of worship. In the course of time, an entire sadhana will unfold before you. These mantras and yantras are a boon, and will allow you to awaken a very important source of strength within yourself. Shakti has to be worshipped and revered if you are to experience her full benefits. Since she is present in everything, you will have to inculcate an attitude of reverence for all that you are, all that you have and all that you experience. A culture that regards Shakti as an energy to exploit, use and strip naked can never attain her full glory, which is of immense and unimaginable potential. From the day you were born, you have been surviving on her handouts. The air you breathe, the water you drink, the food you eat, the homes you live in are all the gifts she has bestowed upon this earth. The iron, steel, gold, silver, gems and wealth are all her creations. No creature has used nature for this sort of benefit, apart from man. Shakti is abundant with prosperity which she reflects through her cosmic nature. She is always replenishing the creation which she has given birth to. So, if you wish to experience the full force of her benevolence, you will have to develop an attitude of reverence towards her, not arrogance. That is the secret key to release the great power of Shakti. Therefore, the mantras of Saundarya Lahari should always be chanted with reverence, as an act of worship and with due respect. It is this attitude of reverence and worship that will unlock the closed door of inner experience and unleash the full force of its magnitude. This book provides a wonderful way to resolve the difficulties and distress faced in life, whether as a grihastha, householder, or a sannyasin, renunciate. It is a book of worship and prayer, which is the highest attitude the mind can assume. This attitude arises when the mind comes under the influence of the atman, or soul. The same gross mind constituted of the twenty-six tattwas, which is subject to time, space and object, is refined to the highest degree, and begins to act in conjunction with the heart and soul. Such a mind projects the higher traits of love, compassion, devotion, surrender, faith and belief, because these are qualities of the soul. Worship requires a one-pointed mind and a pure heart. It also requires a disciplined body and the constant, unbroken attitude of surrender. In addition, the intellect must be balanced so that it does not disturb the mind by undue reasoning, which interrupts the worship. By performing Saundarya Lahari sadhana in this way, you are simultaneously practicing raja yoga, bhakti yoga, hatha yoga, karma yoga and jnana yoga. Thus Saundarya Lahari sadhana is the culmination of yoga, intended to draw out your highest potential. 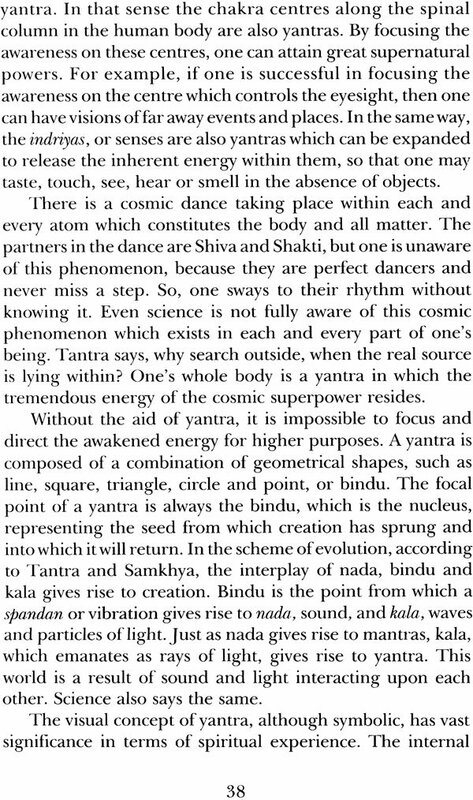 This masterful commentary on Saundarya Lahari reveals Shakta Tantra for every level of aspirant. 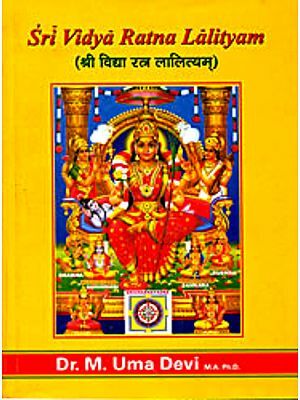 The original Sanskrit text by Adi Sankaracharya has been translated and explained in a lucid and eloquent style, which brings the reader into the living presence of the Goddess. The 103 mantras of this text are presented here as meditations and visualizations of Sri Devi, the root matrix of creation, depicting her divine form as a path of highest sadhana and realization. The text deals with the essence of tantric philosophy and sadhana, elucidating the esoteric traditions of Sri Vidya, the Dasa Mahavidyas, kulakundalini, chakras and tattwas, and their usage to bridge the gap between the outer and inner experience. 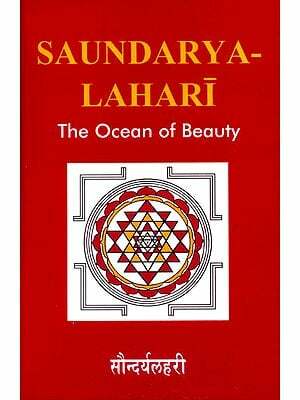 Sri Saundarya Lahari, the Descent, an exposition on the feminine divine, is substantiated and enhanced by the personal experience and in-depth study of the author. 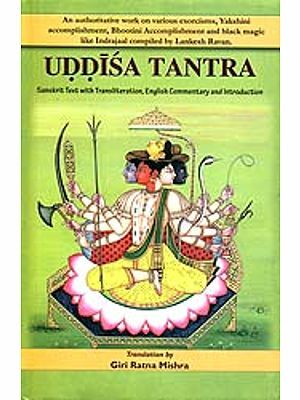 Also included are a comprehensive introduction, prayoga, or uses of the mantras, yantras and especially the mandalas contained in the text, transliteration and index.